Micronutrients are vitamins and minerals required in small quantities that are essential for human health, development and growth. 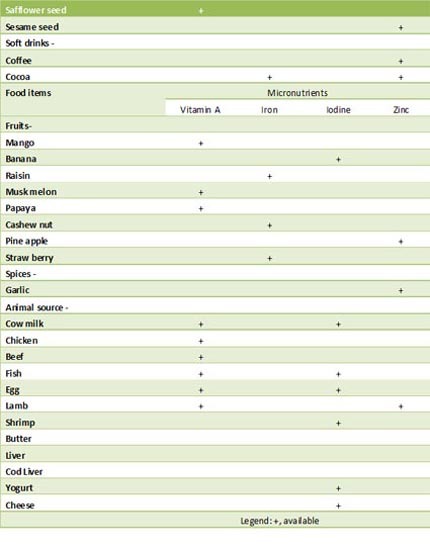 Micronutrients are found naturally in a variety of plant and animal based foods. Micronutrient deficiency affects over two billion people around the globe today. It is one of the leading causes of mental retardation, blindness and death during birth. 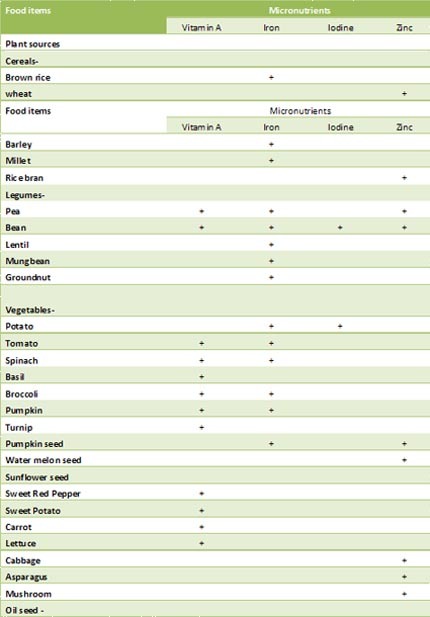 Vitamin A, iron, zinc, iodine, folate, calcium, Vitamin D, and Vitamin B12 are among the important micronutrients. A high proportion of Bangladeshis are suffering from deficiencies of multiple micronutrients. The poor, marginalized, women, food insecure and people living in slum suffer the higher burden (grain, 2014). The major micronutrient deficiency problems affecting Bangladesh are vitamin A, iron and anemia, zinc and iodine (icddrb, b; UNICEF, Bangladesh, GAIN, Institute of Public Health and Nutrition, 2013). Activities to reduce micronutrient deficiency disorders have been implemented in many countries. However, these have mainly consisted of traditional health based approaches focusing on supplementation through capsule and pill distribution. Longer term preventive interventions have been implemented by the agriculture, education and food technology sectors. But the wide spread application of these interventions have also been constrained for lack of awareness and sustainability. Food based approaches that focus on dietary diversification are effective strategies for reducing micro and macro-nutrient deficiencies in malnourished populations. This approach seeks to improve the micronutrient intake of individuals, increase household food security, and advance women’s empowerment. The intervention includes homestead gardening, livestock and poultry production, fish culture, crop diversification and nutrition behavior change. It is known that there is variability of micronutrients including vitamins and minerals in different plant and animal source of food. In view of variability of micronutrient in different common plant and animal sources of food, were reviewed through survey of literature for micronutrient density. The results have been presented in Table 1. Micronutrient deficiencies are severe in Bangladesh. The key food item with respect to micronutrient consumption is vegetables providing about 95% of vitamin A intake, 75% of vitamin C intake and 25% of iron intake. Promotion of the cultivation of vegetables not only would provide households with a ready supply of the nutrients, but also increased production could bring the price down as well.